Welcome back, sorry that I have missed a few, but we are back to reviewing comics every day! Today, Seppin is going to be reviewing Call of Duty – Zombies 2 #1 written by Justin Jordan and art by Andres Ponce. Yes, I am a fan of Zombies. I have made that clear before when I reviewed the Blood of the Dead trailer. Hopefully, Rek doesn’t read this post because he has the opposite opinion to me. He hates it whenever I do anything zombies related, but you know what Rek. I am going to review this book because I want to! So, with Black Ops 4 only a week away. I figured that it would be cool to review the new comic that has been released by Dark Horse. This comic is supposed to give us some of the backstories on these new characters in the Chaos Story. I really like all of the characters that we have going on in this new story. I think that they are more natural and charismatic than the Infinite Warfare zombies characters and most of the WW2 zombies’ characters. 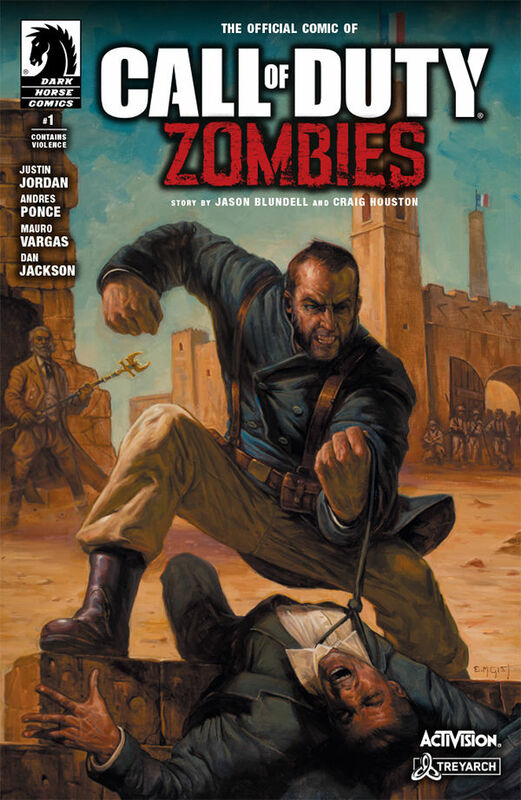 In this issue, we are introduced to Bruno, who is a big french soldier from the Napoleonic era. He seems like the strong and silent type from what we see in this comic. Naturally, I think that he is the coolest character so far, except for maybe Scarlet. We get this really cool story of old explorers and tombs that I really love. I like the old vibe that we get from this and it almost makes me think of the Godfather with the mobsters on their tails. I said there because we have Scarlet’s father here too. We know from the trailers that he is supposed to be some important guy who knows all of the characters and brings them together in a sense. It sounds like he is dead now, but that is just a guess. The story ends with another look at the main antagonists of the story in their cultist clothing looking creepy. Overall, it is an interesting way to start a story and I am excited to learn more about the Chaos crew.